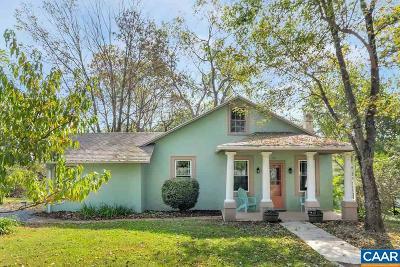 Charming 1920s bungalow in desirable Ivy/Meriwether Lewis location with 3 BRs/2 baths on main level with separate entrance for guest BR. Just 10 mins to UVA but in a quiet country setting. Full kitchen reno in 2015 including white cabinetry from IKEA, butcher block counters, farm sink, 5" handscrape hardwood & stainless appliances. New roof 2014, HVAC, blown attic insulation & energy efficient windows in 2015. Original hardwood, wide wood interior trim/doors/moldings and plasterwork in place. 12x20 deck overlooking relatively flat open yard space & mature trees (peach, walnut, chestnut, dogwood). Large workshop in rear with chicken coop.